Feedom Freedom Blog | "Grow a garden, grow a community." With recent announcements made this year about deregulating genetically modified Alf-Alfa and Sugar Beets, we are slowly but surely not only wreaking unknown havoc on our natural habitats, destroying local economies, and damaging our bodies greater than any of us currently realize. Labeling, always a concern in the age of genetic modification has been fought hard against, and it can be certain that nearly all of the foods that folks consume in food insecure environments contain ingredients that have been genetically modified (most commonly occurring in corn and soy products). As more and more small seeds companies get bought up by mega agribusinesses, such as Monsanto or Dupont, it is of outright necessity that those growing food locally know where there seeds are coming from. Please check out this map (and this article) which visualize the global seed industry between 1996-2008. His remark suggests to me that we need more discussion and understanding of the cultural revolution Detroiters are now making in response to the devastation of deindustrialization. It is transforming how we view our selves, our surroundings and our institutions. We are making a life and not just a living by feeding ourselves, educating our children and taking more responsibility for each other and our communities. This cultural revolution is very different from the cultural revolution involving the education of mostly illiterate Russian peasants advocated by Lenin after the Bolshevik seizure of state power in 1917. It is also very different from Mao’s 1966 cultural revolution which sent millions of educated Chinese youth to work in the countryside and learn from the peasantry. It goes beyond the cultural revolution of the 60s which began to redefine race, gender, generational relations. Today’s cultural revolution, which is emerging from the ground up especially in Detroit, is as awesome as the transition from Hunting and Gathering to Agriculture 11,000 years ago and from Agriculture to Industry a few hundred years ago. Forty years ago Wayne Curtis was a Black Panther. Now a softspoken man with gray dreadlocks, he and his wife Myrtle Thompson are co-founders of Feedom Freedom Growers, a community garden which is revitalizing their east side neighborhood, supplying fresh produce to local restaurants, and energizing and educating schoolkids by giving them opportunities to be of use now by doing work that is real, like growing food. They are also growing hearts and minds. He challenged everyone, especially young people, to accept responsibility for right thoughtfulness, conscience, and right actions. To have faith and to seek guidance when we have questions. To establish just values in terms of human lives and the consequences of taking a life. He was profound in his wisdom and understanding of how war injures all of us. (For more on this gathering, see Gloria Lowe’s report in my January 30- February 5 column). This wide-ranging transformation is taking place in response to the devastation and disaster of our deindustrialized city. Instead of viewing our selves as victims, grassroots Detroiters are discovering and embracing the power within us to create ourselves and our world anew. More than a thousand community gardens have been planted. Neighbors are coming together to look out for each other and to turn war zones into peace zones. Inner city churches which became “parking lot churches” during the 70s as upwardly mobile parishioners fled to the suburbs, are transforming themselves into “place-based churches,” seizing the opportunity to become meeting places for young people struggling to bring the neighbor back into the’ hood. Charles Johnson, the philosopher and artist who won the National Book award in 1990 for his novel The Middle Passage, has described this re-creation of ourselves as “collective transformation through disaster.” It is a black narrative in sharp contrast with the narrative of blacks as victims that made Richard Wright’s Native Son a best seller in the 1940s. But tell me…what do the children say? The following two articles were submitted by the amazing farm workers/Youth Growing Detroit participants/flat out beautiful people Deja and Denae Smith. Both were printed in Feedom Freedom Growers’ newsletter issue 2. My Experience in the Garden was a good learning experience. I learned how to plant seed, grow, weed and even harvest food. My Auntie Myrtle helped me a lot with learning the plants. My favorite food in the garden is squash and my favorite fruit in the garden is watermelon. Even though I don’t like everything in the garden, I still try the food. The good thing about the garden is that we don’t use pesticides; they are really harmful to your body. We even have a compost bin so that we can recycle fresh food items. We also went to the Eastern Market to sell fresh produce and customers will ask us if we use pesticides and we say no. We also got to visit at other community gardens and learned how to harvest our produce. That’s my experience in the garden. Hi, my name is Deja and this is my first year gardening. I have been inspired and encouraged by the garden and my Auntie Myrtle. I have come a long way and have some things I can use later in life: 1) Believe in your experience; 2) Don’t think you are helping just yourself, you are helping the community; 3) Have more than one goal. Healthy eating means a healthy body, and we had a successful garden. What I mean is growing lots of fruits and vegetables that are good for you. To eat healthy to me means keeping your meals balanced. Keep HEALTHY FOOD UP AND JUNK FOODS DOWN – this is very important. Growing and keeping the garden together can sometimes be boring. But there were fun times too. The summits were fun because we would meet new people and play games. We had fun and everything worked out ok. Remember if you’re growing a garden you are growing your community. From Myrtle Thompson-Curtis and Wayne Curtis, below is the opening article to Feedom Freedom’s second issue of their newsletter. An additional article from this issue will be added weekly. Beloved Community is the name Dr. Martin Luther King gave many years ago to a culturally rich, boundary crossing and diverse community. The beloved community that Dr. King spoke of back then still exists today and in fact, we are that community – raising our heads after being down for far too long as we begin to rebuild, one person, one house, one neighborhood at a time. Our society today is onr of extremes: a society of instant gratification where the underdeveloped and unemployed are left feeling abandoned – cut off from the decision making process that rightfully belongs to them as citizens. But lawmakers and corporations don’t worry about such things. Their main priority is profit, even at the expense of human dignity and the world’s resources. Does it sound like any city that you know – where the rich get richer, and the gets poorer? We acknowledge the realization that we must create change for ourselves. Once we understand what our purpose is, and where we are going, we can learn from and draw upon the many great voices of the past and present. Voices such as Grace Lee Boggs, an East side activist for the past 40 years and is still vigorously writing books and inciting transformation toward a more humanistic society. Dr. Huey P. Newton organized, educated and fed people, giving us the example of what it means to grow from a small grassroots group toa strong voice for the people; even influencing policy in the United States. Malcolm X was a boy from the streets and yet became one of the greatest influences to our society. His words still ring true today urging us to search for the truth without ceasing and to gain an understanding of who we are. And there are many more. We at Manistique Garden on the south side of Jefferson enjoyed another great year of growing in 2010! The “Youth Growing Detroit” activities were informative and fun for the kids that participated and even offered them a chance to earn a small stipend for their efforts. The stipend money was an incentive for them to participate for the Garden tours and hands on learning workshops. The highlight for the most of the kids was the opportunity to learn marketable skills by selling garden grown at a special section of the Eastern Market. The kids ranged from ages 2 to 18 years old and activities were designed and implemented for each age group. Food was quite often on the itinerary after the workday was done and they were all pretty ready to eat by then. And I can confirm that the strawberries were so very sweet and tasty as were the juicy Goldie tomatoes. We are creating the circumstances in which we can help ourselves as a community. We grow food as a revolutionary act of love for self and others, employing the resources that were put in place to sustain life: sun, earth, our own labor. We are working toward being that community built on love, joy and hope; that beloved community that Dr. King spoke of building. We are like the people the prophet Isaiah spoke of when he talked of a garden and marriage both growing and joining together. As support from city officials decreases and food lines grow longer, we now rely on growing our own food and making our own work to enrich and empower ourselves, our families and our neighborhoods. We count on each and work together to build a strong and bonded community. When we have no streetlights, we turn porch lights on and listen for potential problems, operating as each other’s eyes and ears. We are the beloved community. When faced with no street snow plowing, we shovel one extra walkway or we pitch in to have someone with heavy equipment do the whole block. Why? Because we are the beloved community. When businesses are not providing quality service we put pressure on them as a community and hold them accountable. We are the beloved community. At Manistique Community Garden, the Feedom Freedom Grower’s find hope and purpose to practice spiritual principles, which include respecting the laws of nature, co-existing harmoniously with other and developing strategies to deal with situations as they arise. We are learning problem solving together and strive to incorporate humanistic practices in our dealings with each other. We are fortunate to have a broad base of friends and support, from the neighborhood block club president to the community security persons that patrol the area and keeping a watchful eye on our streets. Our goal is to take responsibility and adhere to the principle of the great commandment: love your neighbor as you love yourself. Feedom Freedom Growers orchestrated a roundtable discussion last October. The event was a collaborative of students, neighbors, local community activists. They gathered to counteract the negative vibes that surround Detroit with positive and creative new solutions to old problems. We plan to do the roundtable again. ** If you feel you have a positive contribution to add to the conversation or would like to just listen in, please join us at the Hope Community Church January 15th 2011 at 11:00 AM. That date is Martin Luther King Day, and we will commemorate him by discussing his contributions and how they are still relevant today. **The January roundtable discussion was incredibly successful. A reflection piece written by Gloria Lowe has been posted to this blog. More information will be available soon about Feedom Freedom’s next roundtable discussion in April. Saturday, January 15, 2011, I attended the second roundtable discussion conducted by the young people of Feedom Freedom Growers, the community garden created by Myrtle Thompson-Curtis and Wayne Curtis. a former Black Panther, on Manistique St. on the east side of Detroit. The discussion took place at the Hope Community Church not far from the garden. About 40 people of all ages, from youngsters to elders, participated. We were from all over Metro Detroit: east side. west side, downriver, southwest, Grosse Pointe. The discussion centered around rebuilding our communities through re-creating the Beloved Community. How can we achieve this sense of community in the 21st Century? How do we correct racial injustice? What is non-violent civil disobedience? What would Dr. King say and why are his words important to us today? Karmen, a facilitator and social worker, pointed out the number of young people who are ªlostº because of family dynamics involving drugs, incarceration, abuse and mental health concerns. Young people are forced to make it on their own. The Village is no longer helping to raise the children. We need to recreate this vital mechanism, reaching out to love our children unconditionally, showing them that we are concerned for their well-being despite their circumstances. A hug, a smile, compassion in our words correcting unacceptable behavior, are needed. A colleague suggested a day of atonement to the youth, declaring our unconditional love and our commitment to join in the quest for a more just world for all people. He challenged all of us, especially young people, to accept responsibility for right thoughtfulness, conscience, and right actions. To have faith and to seek guidance when we have questions. “We need to establish just values in terms of human lives and the consequences of taking a life.” He was profound in his wisdom and understanding of war and how it injures all of us. A four year old told a joke and a seven year old rapped. We concluded our discussion with the commitment to continue this kind of dialogue, asking more people to join with us. This kind of conversation is essential to the creation of change, which starts from within our selves. It was possible because the Feedom Freedom community garden had already begun to create a community. I left with only one thought. The Dream is being realized but God requires so much more of us in spirit because there is so much more to do. According to Chavannes Jean-Baptiste, coordinator of the Papay Peasant Movement (MPP), “there is presently a shortage of seed in Haiti because many rural families used their maize seed to feed refugees.”[ii] Like any benevolent disaster capitalist corporation, Monsanto extended a hand in a time of crisis to the 65 percent of the population that survives off of subsistence agriculture. But not just any hand was extended in this time of great need, rather: a fistful of seeds. The extended fist was full of corn seeds, one of Haiti’s staple crops, treated with the fungicide Maxim XO. With similar benevolence, not just any tomato seeds were donated to the agrarian peasants, but tomato seeds treated with Thiram, a chemical so toxic the Environmental Protection Agency (EPA) has ruled it too toxic to sell for home garden use, further mandating that any agricultural worker planting these seeds must wear special protective clothing. [iii] Happy Easter! Monsanto’s web site’s official explanation for this toxic donation is that “fungicidal seed treatments are often applied to seeds prior to planting to protect them from fungal diseases that arise in the soil and hamper the plant’s ability to germinate and grow. The treatments also provide protection against diseases the seed might pick up in transfer between countries.”[iv] However, according to the New Jersey Department of Health and Senior Services Hazardous Substance Fact Sheet, “repeated exposure [to Thiram] can affect the kidneys, liver and thyroid gland. High or repeated exposure may damage the nerves.”[v] Why would Monsanto be so eager to donate seeds that could potentially compromise the health of so many famished people? “The Haitian government is using the earthquake to sell the country to the multinationals!” stated Jean-Baptiste. Welcome to the new earthquake. “[It’s] a very strong attack on small agriculture, on farmers, on biodiversity, on Creole seeds … and on what is left of our environment in Haiti.” – Chavannes Jean-Baptiste, executive director of the Peasant Movement of Papay. Monsanto is also responsible for other life-changing inventions, such as the crowd-pleasing Agent Orange. The Vietnamese government claims that it killed or disabled 400,000 Vietnamese people, and 500,000 children were born with birth defects due to exposure to this deadly chemical. [vi] Up until 2000, Monsanto was also the main manufacturer of aspartame, which researchers in Europe concluded, “could have carcinogenic effects.” In a rare demonstration of social justice, in 2005, Monsanto was found guilty by the US government of bribing high-level Indonesian officials to legalize genetically-modified cotton. A year earlier in Brazil, Monsanto sold a farm to a senator for one-third of its value in exchange for his work to legalize glyphosate, the world’s most widely used herbicide. [vii] In Colombia, Monsanto has received $25 million from the US government for providing its trademark herbicide, Roundup Ultra, in the anti-drug fumigation efforts of Plan Colombia. Roundup Ultra is a highly concentrated version of Monsanto’s glyphosate herbicide, with additional ingredients to increase its lethality. Colombian communities and human rights organizations have charged that the herbicide has destroyed food crops, water sources and protected areas and has led to increased incidents of birth defects and cancer. With more than 11.7 billion dollars in sales in 2009 and more than 650 biotechnology patents – most of them for cotton, corn and soy – Monsanto is an economic powerhouse. Nine out of ten soybean seeds in the US are also linked to Monsanto. Together with Syngenta, Dupont and Bayer, Monsanto controls more than half the world’s seeds with no effective anti-trust oversight. One of the world’s most powerful corporations, Monsanto teamed up with United Parcel Service to have the 60,000 hybrid seed sacks transported to their intended destination for Easter 2010 in its drive to trickle down some good to the little guys. Distributing Monsanto’s seeds on this auspicious occasion was a $127 million project funded by the US Agency for International Development (USAID), called “Winner,” designed to promote “agricultural intensification.”[viii] According to Monsanto, the original decision to donate seeds was made at the World Economic Forum in Davos, Switzerland,[ix] unbeknownst to Haiti. “Without chemicals, life itself would be impossible.” -Monsanto’s former motto. Foreign farmers are not the only ones affected by these product features and associated business practices. As of 2007, Monsanto had filed 112 lawsuits against US farmers for alleged technology contract violations on GMO patents, involving 372 farmers and 49 small agricultural businesses in 27 different states. From these, Monsanto has won more than $21.5 million in judgments. In estimates based on Monsanto’s own documents and media reports, the multinational corporation appears to investigate 500 farmers a year. [xii] “Farmers have been sued after their field was contaminated by pollen or seed from someone else’s genetically engineered crop [or] when genetically engineered seed from a previous year’s crop has sprouted, or ‘volunteered,’ in fields planted with non-genetically engineered varieties the following year,” said Andrew Kimbrell and Joseph Mendelson of the Center for Food Safety. [xiii] A Monsanto seed will often magically appear in an ordinarily organic field, giving Monsanto grounds for an onerous lawsuit that will eventually lead to the complete occupation of the innocent farm. As the new earthquake continues to shake, this seemingly benevolent donation of vegetable seeds will forever change the paradigm of Haitian agriculture and thus lead to its further dependence on seeds that poison both the soil they are grown in and the bodies that consume them and that create financial dependency on the biotechnology firm Monsanto. “Our people will never be autonomous if Haiti has to suffer through what is called generosity, but makes us dependent on corporate control in agricultural production,” said Catherine Thélémaque of Action SOS Haiti in Montreal. [xvi] Agroecologists Ivette Perfecto and John Vandermeer, at the University of Michigan, have recently published a study showing that sustainable, small-scale farming is more efficient at conserving and increasing biodiversity and forests than industrial agriculture. [xvii] With less than 1 percent of its original forest coverage remaining, Haiti cannot gamble on the disastrous environmental effects of hybridized industrial monoculture to feed its many hungry. “If the US government truly wants to help Haiti, it would help the Haitians to build food sovereignty and sustainable agriculture, based on their own native seed and access to land and credit. That is the way to help Haiti,” says Dena Hoff, a diversified organic farmer in Montana and member of Via Campesina’s International Coordinating Committee. In his 1780 History of European Colonization, Guillame Raynal remarked that there were signs of an “impending storm.”[xviii] This storm erupted into a full-fledged monsoon on August 22, 1791, when Dutty Boukman sounded the conch shell and the slaves of Saint Domingue rose in revolt against the French imperialists. Under the leadership of Touissant L’Overture and Jean-Jacques Dessalines, the slave rebels overthrew the imperialist occupation of Napoleon Bonaparte and in 1804, Haiti was declared a free republic. Lest we forget the lessons of history, we cannot discount the power of unity. Much as Napoleon himself did, a tyrannical corporation such as Monsanto exports poverty, would keep the people as agricultural slaves and must be resisted. It’s time for Boukman to sound his conch once more: La liberté ou la mort! i. Bell, Beverly. “Haitian farmers commit to burning Monsanto hybrid seed.” Huffington Post, May 17, 2010.
ii. La Via Campesina, “Haitian peasants march against Monsanto Company for food and seed sovereignty,” June 16,2010.
iii. Extension Toxicology Network, Pesticide Information Project of the Cooperative Extension Offices of Cornell University, Michigan State University, Oregon State University and University of California at Davis. iv. Veihman, Mica. “Five Answers on Monsanto’s Haiti Seed Donation,” Beyond the Rows, May 20, 2010.
vi. MSNBC, “Study Finds Link Between Agent Orange, Cancer,” January 23, 2004, The Globe and Mail, “Last Ghost of the Vietnam War,” June 12, 2008.
vii. Kenfield, Isabella, “Monsanto’s seed of corruption in Brazil.” North American Congress on Latin America, October 16, 2010.
viii. PR Newswire. “Monsanto Company Donates Conventional Maizeand Vegetable Seed to Haitian Farmers to Help Address Food Security Needs,” May 13, 2010.
ix. Monsanto Company, “Monsanto donates maizeand vegetable seed to Haiti.” Monsanto Blog, May 13, 2010.
x. Shiva, Vandana, “The Suicide Economy Of Corporate Globalisation.” ZNet, February 19, 2004.
xi. Chopra, Anuj, “Debt drives farmers to suicide.” The National, January 20, 2009.
xii. Center for Food Safety, “Monsanto vs. US Farmers,” Nov. 2007.
xiii. 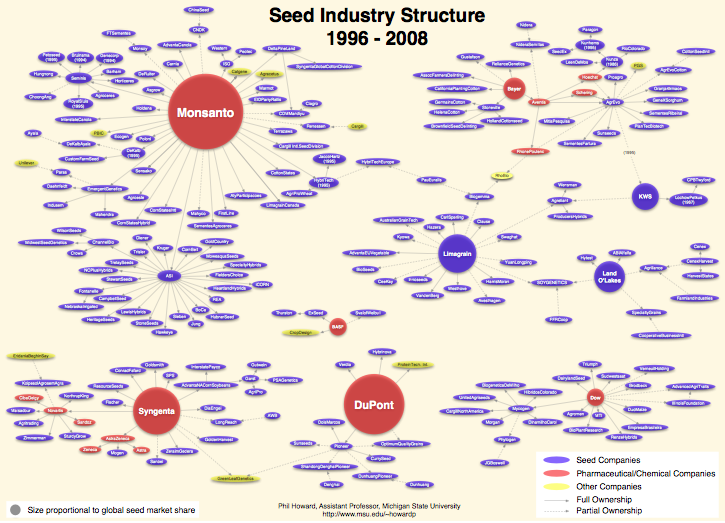 Andrew Kimbrell and Joseph Mendelson, “Monsanto vs. US Farmers,” Center for Food Safety, 2005.
xiv. Urfie, Fr. Jean-Yves, “A new earthquake hits Haiti: Monsanto’s deadly gift of 475 tons of genetically-modified seed to Haitian farmers.” Global Research. Canada. May 11, 2010.
xv. Holt-Gimenez, Eric. “Haiti: roots of liberty, roots of disaster.” Huffington Post, January 21 2010.
xvi. Organic Consumers Association. “Canadian Groups Support Haitian Rejection of Monsanto’s Seed Donation,” June 3, 2010.
xvii. University of Michigan. “SNRE Professor Perfecto co-authors PNAS paper on family farms, biodiversity and food production.” Ann Arbor, Michigan, February 22, 2010.
xviii. Center and Hunt, “Liberty, Equality and Fraternity,” 119. The “Food Safety Modernization Act,” also known as the S.510 bill, aims directly at independent farmers across America, in turn supporting the large corporate food conglomerates. The government claims that this bill increases safety for everyone, by giving the Food and Drug Administration (FDA) more control to recall products and to enforce stricter growing requirements farms. This seems benign so far, right? Well, it’s not. The Bill has negative implications for small, often times organic, farms. The bill criminalizes seed saving, from season to season. This clearly has no other beneficial effect that making it easier for large corporate entities, such as Monsanto, the company responsible for the proliferation of genetically modified foods and the use of pesticides. The Bill would also mandate the filing of a large amount of paperwork that many smaller farms likely would not have the resources to comply with. A study by Senator Tom Coburn‘s (R-OK) office states “on the whole this bill represents a weighty new regulatory structure on the food industry that will be particularly difficult for small producers and farms to comply with (with little evidence it will made food safer.) On the other hand, the bill does include an amendment from senator John Tester (D-MT) which would exempt the massive amount of paperwork, and federal regulation for farms that garner under $500,000 a year in sales. Hopefully this amendment is included if the bill passes. A vote is scheduled for this Monday, November 29, 2010.